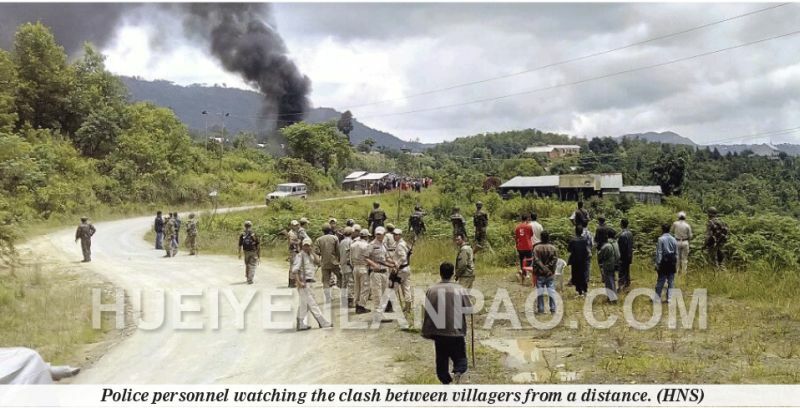 Ukhrul, August 06 2015: The District Magistrate of Ukhrul district on Thursday promulgated Prohibitory Orders under Section 144 CrPC on the entire Halang/Huining village in northern part of the district after mob violence erupted over erecting of monoliths and observance of Huining Ato Shanao Long Raising Day in the backdrop of a long-running land dispute between Huining Ato and Halang Aze villagers. Reports culled from the spot have said that around 10 am on Thursday Huining Ato villagers and delegates from nearby villages had gathered at Huining Junction to celebrate the Raising Day of Huining Ato Shanao Long when hundreds of villagers from Halang Aze armed with firearms and catapults stormed the venue and started attacking the gathered public. A team of Ukhrul police personnel deployed in the village since the past few days due to volatile situation attempted to stop the marauding attackers by firing several rounds of tear gas shells but failed to disperse the villagers. In the ensuing attack, many villagers of Huining Ato and several police personnel sustained injuries from catapults. Halang Aze villagers then went ahead and vandalized the dais and burnt down hundreds of chairs apart from damaging the windscreen of two vehicles belonging to Ukhrul SDPO and Reserved Police at the venue. Following this District Magistrate Worshang Hungyo and another police reinforcement team led by the Ukhrul SP Ningshem Vashum and Adl SP Misao rushed to the spot and brought the situation under control. Around 2:30 pm the District Magistrate then promulgated the prohibitory orders. Soon after, the prohibitory order was announced through PA system and the police in sizable strength managed to disperse the mob. Meanwhile, the Raising Day of Huining Ato Shanao Long was observed soon after the situation was brought under control. Tension had been simmering in the village after Halang Aze villagers vandalized two monoliths of Huining Ato in the wee hours of August 3 to register disapproval of erecting the stones in honor of late Abner Varah who was lynched by the former in the inter village clash and that of Shanao Long formation. Huining Ato Village has around 150 houses while Halang Aze has about 500 houses. The two villages have been locked into a long running conflict over land ownership for years.